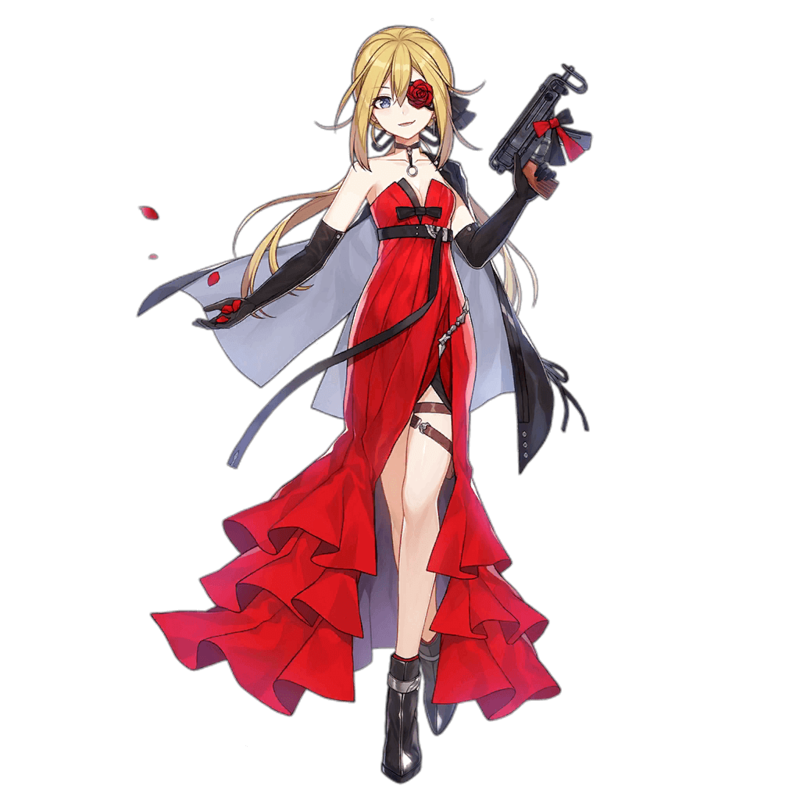 Skorpion is a high Evasion offtank SMG who relies on her Incendiary Grenade to deal a high amount of AOE damage. Her high Evasion does allow her to tank to a mediocre degree, but her very low HP and offensive skill prevents her from being as effective of a Main Tank as she could be. Skorpion’s poor Tile buff coverage also makes her less appealing as a Main Tank, as its distribution means she is unable to buff multiple ARs at once. That isn’t to say, however, that she is unable to compensate for her weaknesses. Although Skorpion’s base Damage stat is low, the high Damage multiplier on her Skill, Incendiary Grenade, improves her total DPS significantly. This skill is perfect for her recommended Offtank role, as the skill allows her to deal significant AOE damage in a battle. In conclusion, Skorpion is often an excellent Offtank choice for new players building AR/SMG Echelons due to the ease of obtaining her and her high AOE damage. Despite her merits, though, her ability to output damage falls off significantly late game due to her low max Damage stat. Nevertheless, Skorpion still remains one of the best choices for a budget SMG offtank. Skorpion’s Incendiary Grenade initially deals 6x her Damage and then deals 1x her Damage every 0.33 seconds for a 5 second duration(This has been tested and verified in-game for accuracy). Although most of the damage she deals through her Skill does come through DOT (Damage Over Time), the total damage dealt is very impressive. Skorpion boasts a very high Evasion stat and is able to evade most incoming damage. As an Offtank DPS smg, her high Evasion allows her to shoulder her share of enemy fire. Skorpion’s low base HP makes her unfit in any role other than Offtank as she will not be able to last long under focused fire. 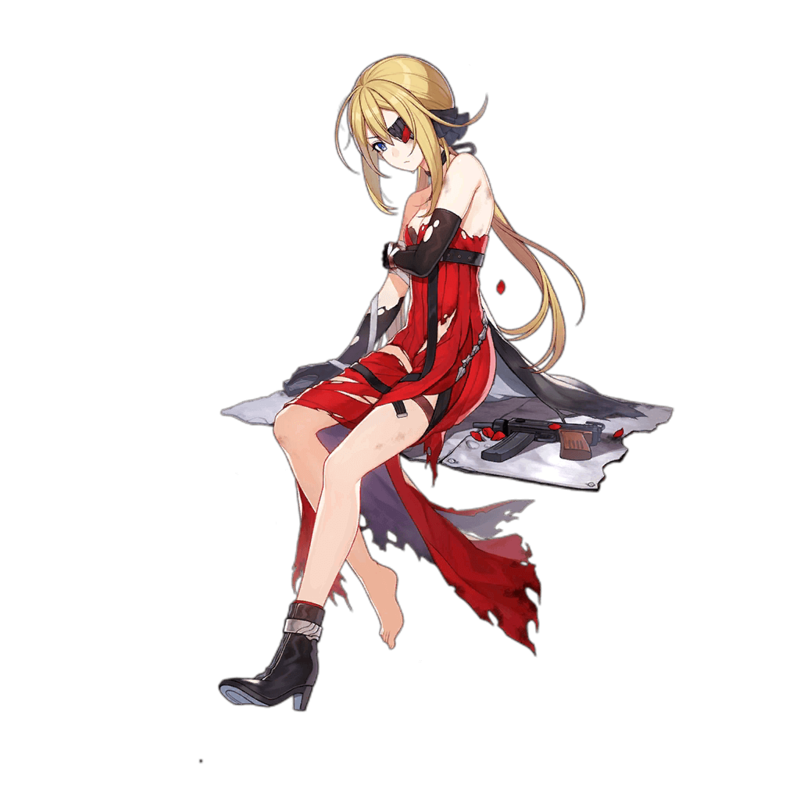 Skorpion’s low base Damage stat acts as a balance towards her high Damage multiplier she gains through her Skill. Only having 24 base Damage significantly weakens the damage dealt by her Incendiary Grenade. Skorpion is only able to buff the AR behind her, making her a inflexible choice in many AR+SMG Echelons. As a common Offtank, Skorpion sees a fair bit of use in many AR+SMG Echelons as a budget Offtank. Although she does have her limitations, her strengths are also notable as well. At max level, Skorpion has a very high Evasion stat significantly above her class average and high RoF which sits 10 points above her class average. While she does have the high Evasion stat necessary for a Dodge tank, Skorpion has a low HP stat that is significantly below her class average, making her suboptimal for a Main Tank role. Combined with a Damage stat that’s 4 points below her class average, Skorpion may seem unappealing stat wise. That isn’t to say that Skorpion does not have any redeeming qualities. Her skill, Incendiary Grenade, is what makes her so powerful while dealing AOE damage. Not only does it have an immediate 6x Damage multiplier on explosion, but it also provides a significant amount of additional burning damage -- dealing 15x her Damage over 5 seconds. By having a total Damage multiplier of 21x and a short Initial Cooldown of 3 seconds on her Skill, it is clear how Skorpion’s damage output is impressive. Her Skill, however, is not without its issues. Because the majority of damage from her Incendiary Grenade comes from DOT (Damage Over Time), it enables foes to have more time to attack the Echelon. Similarly, Skorpion’s very low Damage stat significantly impacts the effectiveness of this Skill, which tends to reveal itself when tackling difficult content -- the Incendiary Grenade won’t do much damage to strong enemies. Inside an AR+SMG Echelon, Skorpion can provide a mediocre buff to the AR situated directly behind her. The tile placement of her buff is serviceable, as Skorpion most likely will be situated in an Offtank position in front of the ARs in the Echelon. A 15% RoF and 50% Accuracy boost are actually quite acceptable, so the only issue with Skorpion’s tile buffs is that her tiles lack good coverage. Overall, Skorpion is an amazing budget Offtank SMG who is a great fit for her role. Not only is she able to tank a decent amount of damage, but she can output good AOE damage with her Incendiary Grenade in the early to mid game and is easy to obtain and Dummy Link. It is highly recommended for new players to use Skorpion if they are in need of an Offtank SMG for a AR+SMG Echelon -- very few other SMGs offer her benefits along with her accessibility. Small buffs to Skorpion’s Damage can create big differences to her Skill due to its Damage multiplier. ARs such as 416 and G36 would therefore be a good choice of teammate. ARs that provide Evasion tile buffs complement Skorpion’s already high Evasion stat and allow her to Dodge more incoming fire. ARs such as G41, FAL, and FNC all provide excellent buffs to her EVA. Unfortunately, Skorpion’s ROF tile buff can put many ROF boosting ARs over the ROF cap. Because of this, it is more efficient to have ARs with Damage boosting skills receive her tile buff in order to maximize the resulting DPS of the team. ARs like Type 95, G41, and 9A-91 (At Night) are perfect for this role. Because Skorpion lacks the HP to tank consistently, it is recommended to shift her to the side of the main tank. In this offtank position, Skorpion will be under less enemy fire and thus relieve her of some of the pressure that comes with tanking. The Skorpion is a machine pistol developed in 1959 by Miroslav Rybář and produced in the Česká zbrojovka arms factory. While it was intended to be used by the security forces and special forces, the weapon eventually was accepted into service with the Czechoslovak Army, becoming a popular sidearm for low ranking army staff.